Halloween has us feeling pretty festive here at Team LC and Lauren’s annual DIY costume contest has us even more in the spirit for this season’s tricks and treats. 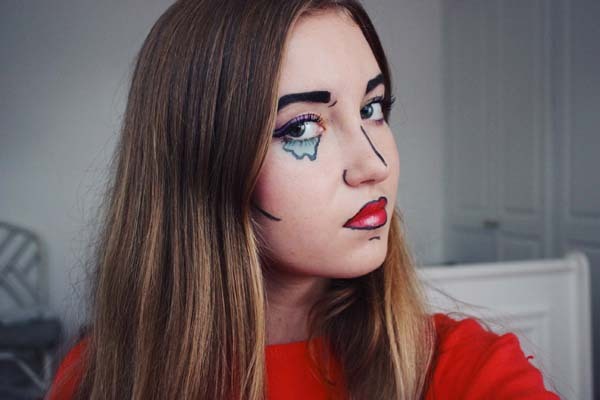 We’ve been getting girly and ghoulish costume submissions and some pretty amazing beauty tutorials as well. 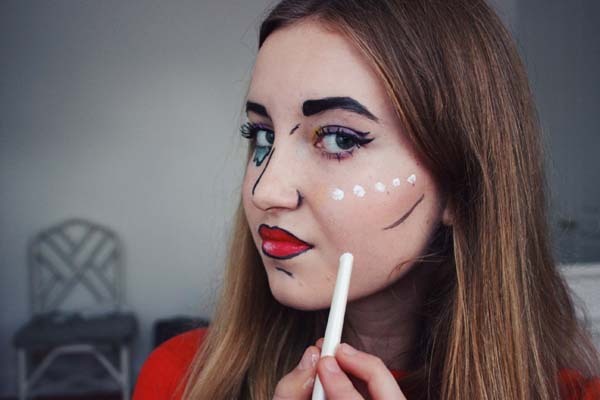 Last week, we featured our winner Ashley’s whimsical unicorn costume DIY, and this week we have quite the makeup master on our hands… Thank you, Emma, for sending us over your colorful (and artistic) pop art makeup tutorial! 1. 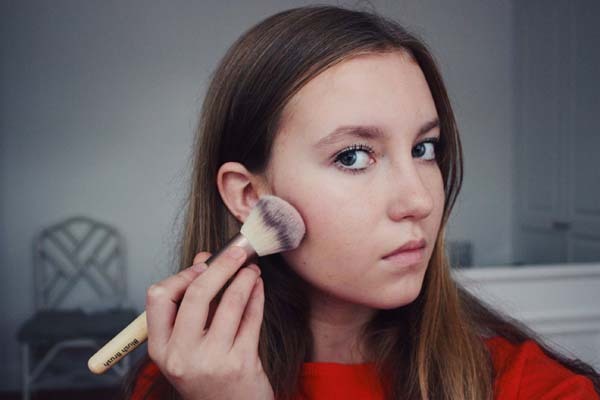 Start with a clear foundation and apply blush to the apples of your cheeks. The brighter the better. This look is all about contrast between colors! 2. Fill in your eyebrows with the black liquid eyeliner, keeping the edges sharp and defined. 3. 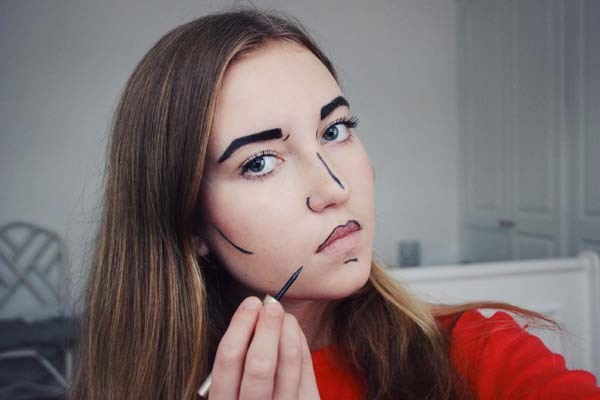 Draw lines with the eyeliner on your nose, under your cheekbones, under your bottom lip, and in between your eyebrows or anywhere that you would normally contour. 4. 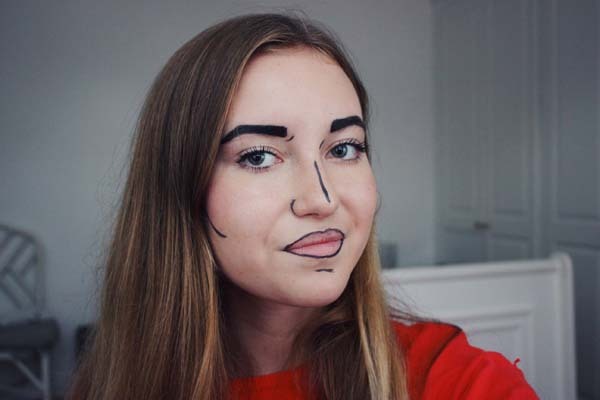 Draw an outline of your lips. 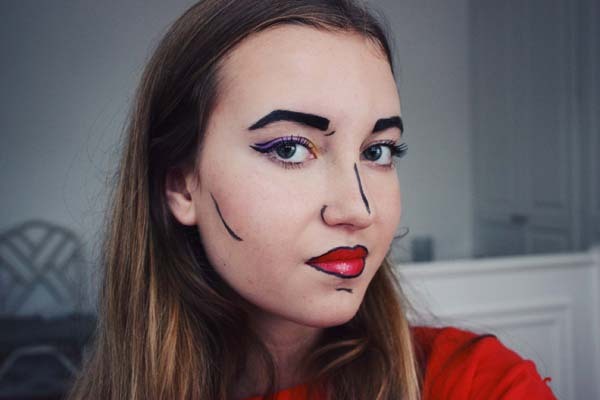 You may need to make the bottom lip extra thick to make the line look even. 5. Fill in your lips with a bright lipstick. Add a spot of white eyeliner if you’d like to add depth. 6. For the eyes, start to draw a dramatic wing. Next, use a bright, pigmented eye shadow on your eyelid. Add another color towards the inner eye for extra detail. 7. Draw another wing coming from inside or above the crease of the eye, following the shape of your first wing. 8. Finish off the eye with lots of mascara and false lashes. 9. 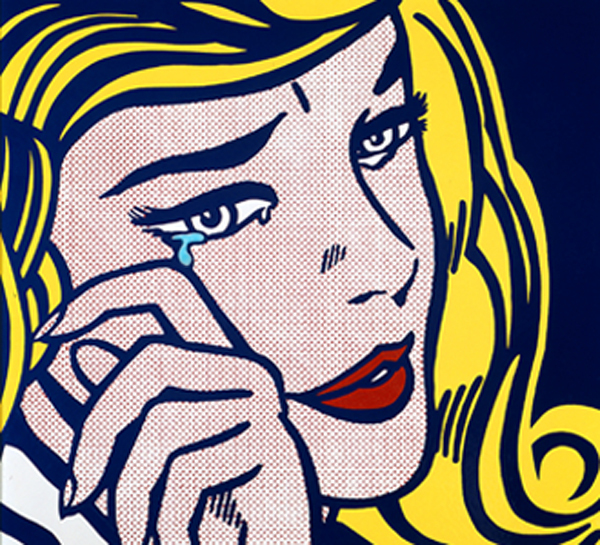 For the tear, draw the shape that you want with blue eye shadow. 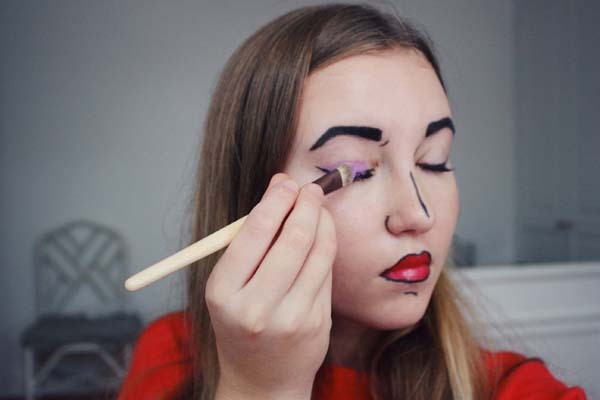 Outline that shape with black eyeliner, and then clean up the outer edges with a Q-tip. 10. 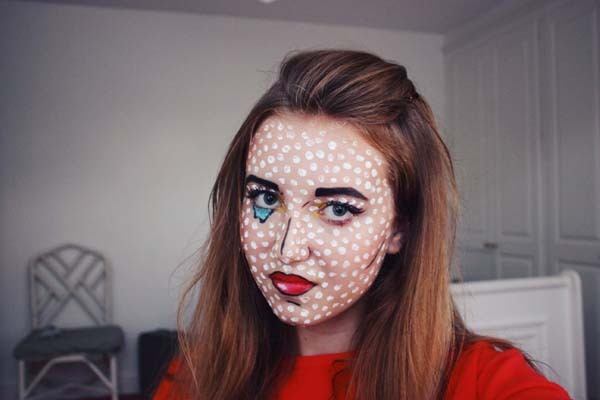 Lastly, put small dots of white or red face paint all over your face. 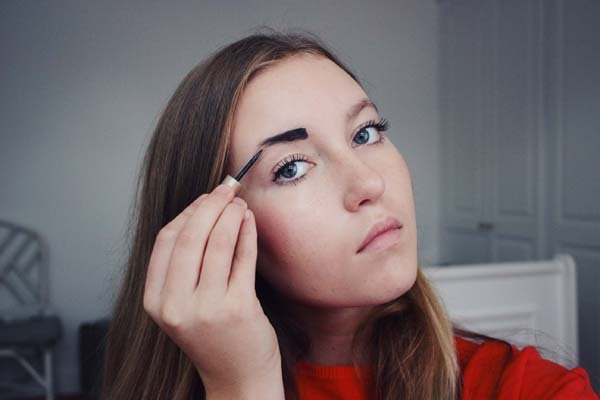 The best way to do this is to use the other end of an eye shadow brush, or a Q-tip. Top the whole look off with voluminous hair and a cute color block outfit! 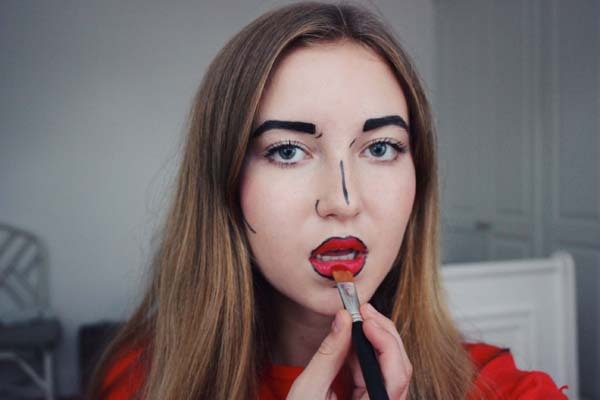 Are you daring enough to try this bold look for Halloween? 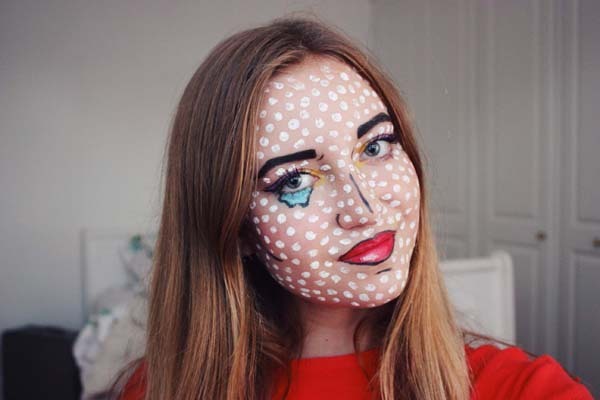 If you haven’t submitted your DIY Halloween costume yet, now is the time! We will continue to take costume submissions all month long, so click here to read our guidelines for how to submit your DIY Halloween costume. Our winners will be featured here on LaurenConrad.com each Friday.